As you build out your optics kit, the spotting scope is a necessary component for longer-term, higher-magnification observing. Unfortunately most quality spotting scopes are larger, heavier, and more expensive. Luckily there is a new spotting scope space that rivals binoculars in size, but offers the performance and magnification of of a quality spotting scope. A new kid on the rather small block of micro spotting scopes is the Celestron Hummingbird ED Spotting Scope. 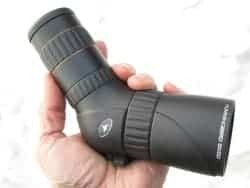 Where the Hummingbird differs from the others in its space is with ED glass, 45 degree eyepiece, and affordable price. 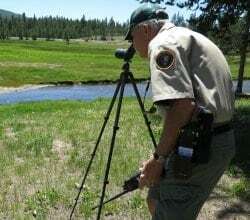 Spotting scopes provide a much more powerful viewing option compared to binoculars and are used for surveillance, target spotting, and, of course, enjoying wildlife. Unless your viewing leans towards astronomy, a 10x bino is on the high side, with 8x a normal power for those who anticipate scoping subjects during or after exertion. Seven power is reserved for use on boats, and anything below that is for the opera or when something small enough to slip into a shirt pocket is needed. But spotting scopes, while rarely starting their magnification in the single digits, quickly move into the 20s, 40s, and higher powers. 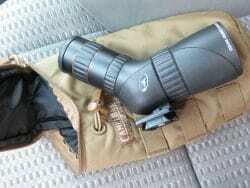 In the case of the Celestron Hummingbird ED Spotting Scope, two options are available with a 7-22×50 and a 9-27×55. Spotting scopes bridge the gap between binoculars and telescopes. They range in power from about 10x to 60x. Above 60x and you are well into telescope territory. Spotting scopes are also identified by their objective lens (the target-facing end of the scope) diameter measured in millimeters. A small objective is about 30mm while an average scope might be around 60mm. Large spotting scopes have 80mm or larger diameter objective lenses. As the objective grows in size, so to0 does the rest of the scope that houses the scope’s internals. The numbers of a scope describe the optics but not the optical quality. Many spotting scopes have variable power (zoom) eyepieces that change the magnification through a rotation of a collar on the eyepiece. The difference between zoom and variable power is that a true zoom will retain focus throughout the magnification range while a variable power requires refocusing when the power changes. The light gathering of the scope is noted by the diameter of the outer objective, and the bigger the number, the more light enters the system. Celestron’s Hummingbirds are 50mm and 56mm respectively. Fifty millimeters is not an unusual rifle scope size so for perspective, 60mm is a common starting diameter in a spotting scope company’s product line with the numbers going up from there. Binoculars also use objective diameter numbers as in 10×50 or 4×32. In these cases, the 50 and 32 represent the objective size in millimeters. So, you can see that even a small scope like the Celestron Hummingbird 7-22x50mm ED Micro is on the big size for binocular and rifle scope objectives. On the other side, telescopes transcend millimeters pretty quickly when above 90mm. Inches are the preferred unit of measure where eight inches (203mm), 10 inches (254mm) and 12 inch (305mm) scopes are common telescope objective/mirror sizes. One major way to save weight is to limit the diameter of the optics. 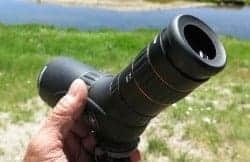 The Celestron Hummingbird 7-22x50mm ED Micro Spotting Scope was tested because it was the smaller of the two small scopes and small was the objective, both figuratively and literally. There are plenty of larger scopes on the market, but quality mini spotting scopes are still fairly rare. Possibly because they can be viewed as a contradiction. The smaller the lenses, the less light the scope gathers leading to lower performance as daylight diminishes, or with dawn still in the future. But once there is enough light which happens to be the majority of the day, the limitations of larger heavier objective lenses are lessened. However, if you don’t or won’t carry your spotting scope into the field due to its size and/or weight, then that huge objective lens that likely cost a bundle now distracts from usefulness. So everything is a tradeoff. No point in owning the best if you won’t or can’t carry it, and no point in miniaturization if it loses its usefulness. Other features of spotting scopes include interchangeable eyepieces, zoom eyepieces, ED glass, mounting options, water and shock proofing, nitrogen or argon filled, rubberized or armored exteriors, fine and coarse focusing, straight or angled eyepieces, integrated shades, transport cases and camouflage covers, and even integrated rangefinders for those with more tactical needs. Other considerations of spotting scopes include the weight, size, and brand reputation. In the case of the Celestron Hummingbird 7-22x50mm ED Micro Spotting Scope, the weight is a touch over a pound, the size is about a pistol, and the brand is known for building world-class optics especially those of the high-powered telescope variety. The ED glass, or Extra-low dispersion glass helps to compensate for the difference in how colors of light bend when moving through lenses. The size of the wavelengths of visible light (well, all light for that matter) causes it to have a unique refraction when “bent” with a lens. Objects, especially lighter colored ones, when viewed through a higher magnification (think more bending) optic can cause the light waves to separate into colors causing “fringes” of color to appear especially where there are light-dark boundaries. To combat the so-called chromatic aberrations, rare earth elements are mixed with the silicon when making the glass. In many ways, glass making is like knife blade making. There is silicon and steel, and then there are a multitude of additional elements that can be added in proprietary quantities creating a lens or knife with unique properties and best suited for its tasks. Out in the field, the Celestron Hummingbird 7-22x50mm ED Micro Spotting Scope is a winner for wildlife and bird watching, general observation of the greater outdoors, and a fine close-work mini-telescope. With a minimum focus distance of under 10 feet and over half-an-inch of eye relief, this Hummingbird can sing. 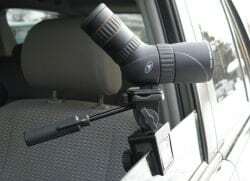 Its lightweight and compact size allow for quick and easy handheld use, but bolted to a tripod or truck window mount using its integrated tripod socket locks in a viable viewing platform you can use for hours with little or no eye fatigue. I did notice one thing that hopefully other users won’t encounter and that is it’s hard to clean dirt out of the eyepiece. The dirt was not inside the eyepiece, but I did manage to fill the eyepiece cup with a fine powdered soil. It all started while using the Celestron Hummingbird 7-22x50mm ED Micro Spotting Scope in Yellowstone National Park. It was a particularly windy day and while birdwatching at the edge of a open field, the wind caught the light scope and even lighter carbon fiber tripod and tossed them gently to the ground. Fortunately the scope’s fall was broken by grass and silky soft powdered dirt. Unfortunately the scope landed user-side down in the soil effectively plugging the eyecup area with dirt. Most of it fell out and much more blew off with little effort. 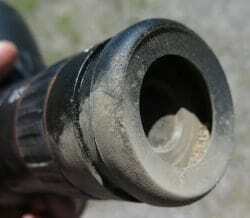 However the coarse threads of the screw-out eyecup remained filled with dirt as did the rim of the eyepiece lens. The eyecup was glued in place and required forced removal to get at the stubborn dirt. In the end, it was no big deal, and I’m sure the rubber armor covering of the Celestron Hummingbird 7-22x50mm ED Micro Spotting Scope would have easily protected the scope had the ground arrived sooner. Prior to the fall of the scope, I got the opinion of a volunteer park ranger and professional bird watcher. He was impressed with the little scope and was surprised not only with the size, but the quality of the optics. I too have used many spotting scopes and owned a Leica for a while and got some heavy use of a Swarovski. My previous carry prior to field testing the Celestron Hummingbird 7-22x50mm ED Micro Spotting Scope was a Gold Ring Leupold (American made, not a Chinese budget Leupold-branded one). The Celestron Hummingbird 7-22x50mm ED Micro Spotting Scope has a 7-22x eyepiece that is a functional power given the small objective and desire to be held in the hand. 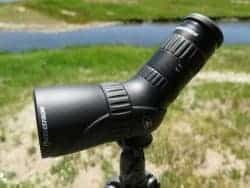 The angled eyepiece is particularly effective for wildlife but can cause issues if used on a bench to view targets. Your eye must be above the scope so if the Hummingbird is on a small tripod that in turn is on the bench, you might have to stand up to see it. When at the range with this scope, I use it on a ground tripod so I can lower it. But that is a case I prefer my straight-sighting Leupold. The scope is packaged with a snug padded nylon case with strap and zipper closure, but I prefer an easier drop-in container from which I can one-handed deploy and stow the Hummingbird. So instead of the included case, I use an insulated Camelbak waterbottle case complete with MOLLE attachments and a little additional storage. The optical performance of the Celestron Hummingbird 7-22x50mm ED Micro Spotting Scope is exceptional except for the final bit of magnification. Above about 18x, I can notice some loss of image quality, and at the full 22x I cannot see near as well as on lower power. Certainly not a deal breaker, but I am spoiled by world class optics with Nikon, Leica, Leupold, and Swarovski. But those brands command impressive prices where a thousand dollars is often the cover charge to get into play. Accessories will follow and, of course, a tripod of equal quality will cost another handful of Benjis. And what usually happens at this point is that a second, less expensive scope is acquired which will get carried, shared, and especially used. So money and the quality it can buy might also be a barrier to practicality and deployment. Celestron broke new ground with its Hummingbird spotting scopes because ED glass is usually reserved for the larger higher-end scopes. Further, they are affordable, portable, and seem plenty rugged for their intended use. So yes, my new feathered friend and travel partner is a Celestron Hummingbird 7-22x50mm ED Micro Spotting Scope.